It is a balmy -4 degrees F today. I never thought I would ever say that I feel warm in this temperature, but after two weeks in much colder temperatures, this feels quite comfortable. 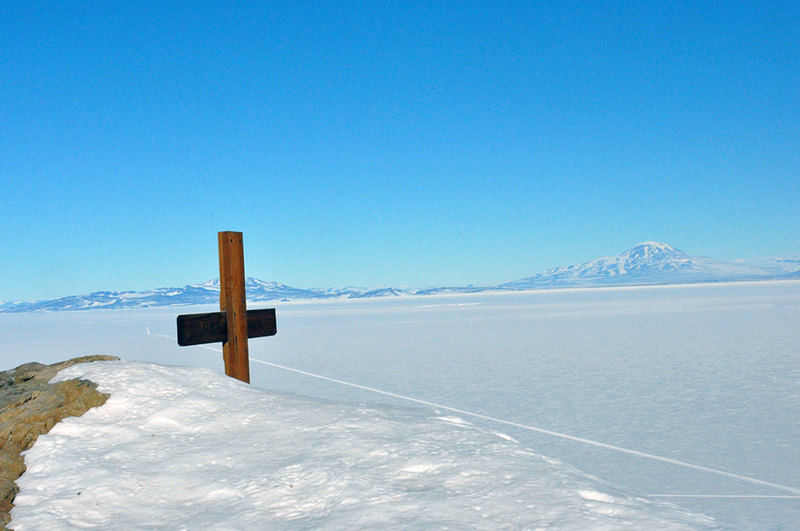 I took a walk today to visit two crosses outside of McMurdo. The first cross, found at the end of a peninsula called “Hut Point,” is made of wood and has a Celtic design with the cross intersecting a circle. It reads, “Sacred to the Memory of George T. Vince of the ‘Discovery’ who drowned in this spot.” Able Seaman Vince was a member of the crew of the “Discovery” alongside the famous captain Robert Falcon Scott. Many crew members of this 1901-4 expedition later became household names during the Heroic Age of Antarctic Exploration. 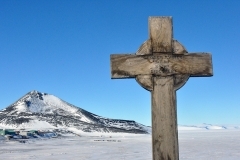 They include Ernest Shackleton, Frank Wild, Thomas Crean and more. A short walk downhill from the cross is the hut that Scott and his crew built. It is preserved in its original state inside a protective structure, complete with scientific instruments, food containers and other items left behind by Scott. 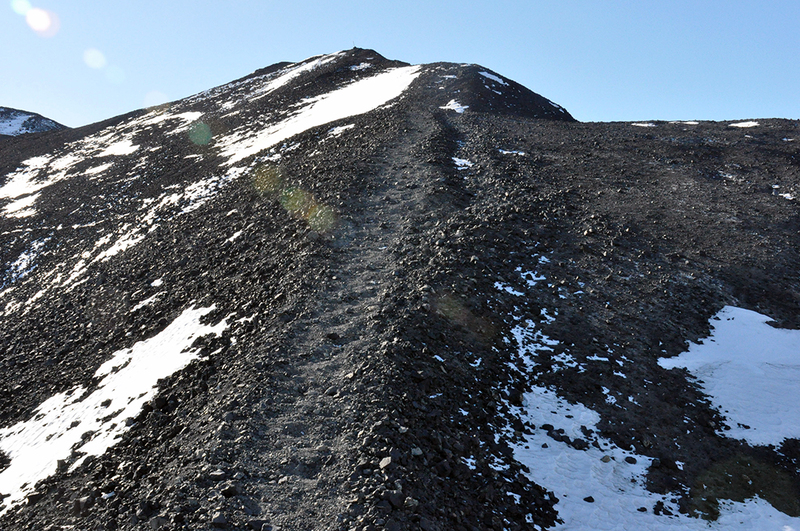 I left the Hut Point Cross for a steep hike up the mountain. 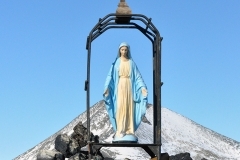 About half way up, I came across “Our Lady of the Snows.” This statue of Mary rises out of the snow covered, volcanic rocks and looks down upon McMurdo Bay. It was built in memory of Richard T. Williams, a US Navy SeaBee that died in 1956 during the initial construction of this research outpost. His tractor broke through the sea ice and he fell into the water. After a walk back to my new home at the station. 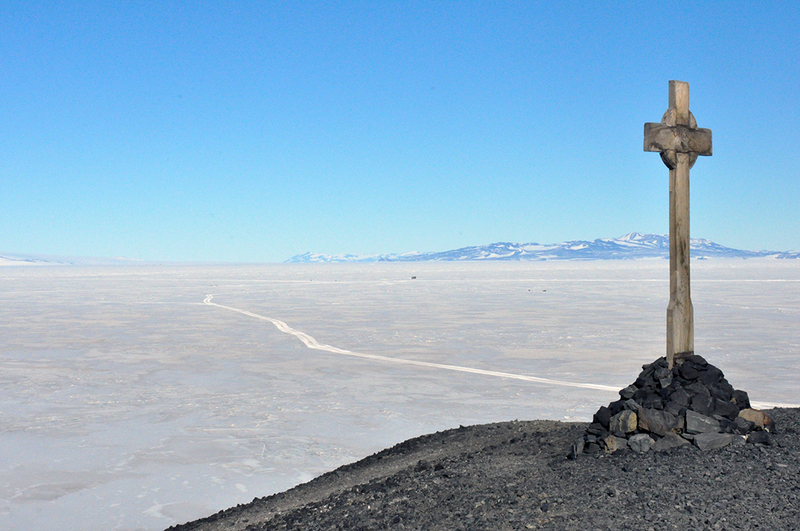 I notice a third cross fixed at the summit of Observation Hill that commemorates Robert Falcon Scott. The memorial is written in four languages. 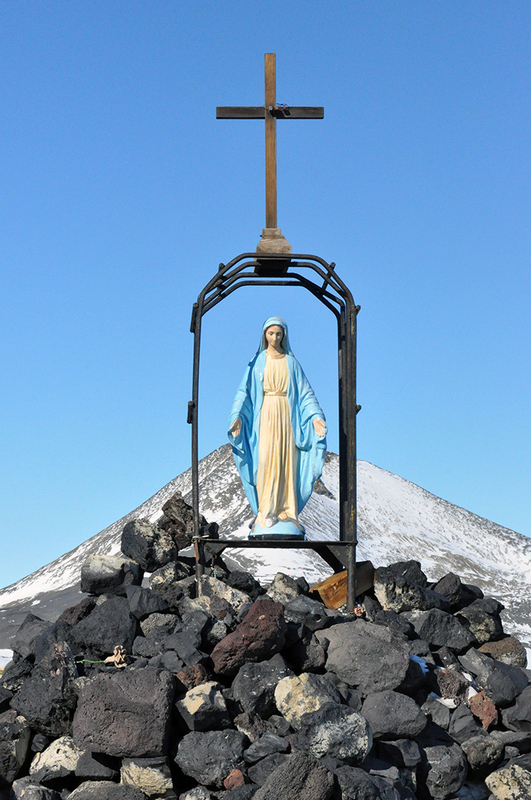 Combined with Hut Point and Our Lady of the Snows, the Observation Hill Cross forms a triangle that embraces this collection of mismatched buildings, science labs, fuel tanks, construction equipment, and, as of today, 942 souls at McMurdo. This is not a religious place by the narrowest definition of the word. But these three crosses remind both the religious and the non-religious alike that there is something bigger than our daily tasks and our individual comfort. The beauty and the danger of Antarctica require our attention not only to daily safety protocols, but also eternal things. It is impossible to ignore. The three crosses also blur the passage of time. One of these crosses can be seen through virtually any window at McMurdo. George Vince, Richard Williams and Robert Scott are never far from view. The memories of these men take away time. Their stories and ours are chapters in a much bigger narrative. 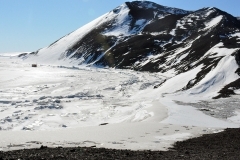 The Heroic Age of Antarctic exploration ran from the last decades of the 19th century through the last Shackleton Expedition ending in 1916. While this age has passed, the heroics have not. My artistic counterpart from New Zealand, Warren Maxwell, put it well. He said, “We are in a new heroic age of scientists.” The work and sacrifice of those that study Antarctica today is no less heroic than the expeditions of Admundsen, Scott and Shackleton. The early 20th century explorers were driven by the urgency of nationalism. The scientists today are driven by a new global urgency rooted in the protection of the planet and all its inhabitants. I learned how to use GPS yesterday. It tells you where you are by using a system of three dimensional triangulation between satellites in the heavens and the estimated location of the earth’s center called the “datum.” This is a standard tool in Antarctica. GPS is a necessary for finding your way home in a blinding snow storm. You need it to retrieve scientific instruments and dangerous crevasses hidden in the ice. The triangle of crosses that embrace this station function like a GPS of the soul. They help us find our way to a deeper home in the midst of the blinding snow storm of daily duties and worries. They remind us of our place within the unfolding story of all those who dare to discover what lies hidden beneath the ice. Beautifully said. The professor gets an A.
I’m greatly enjoying following your journey and wish you a safe return. You have one amazing life.